Editor's Note: Katy was the winner of the Feminine Transitions e-book giveway. Congratulations, Katy! This over 50 style watcher gets a kick out finding scarves for sale in unexpected places. It's not surprising, considering what a "hot trend" scarves are these days. Still, it makes me laugh. 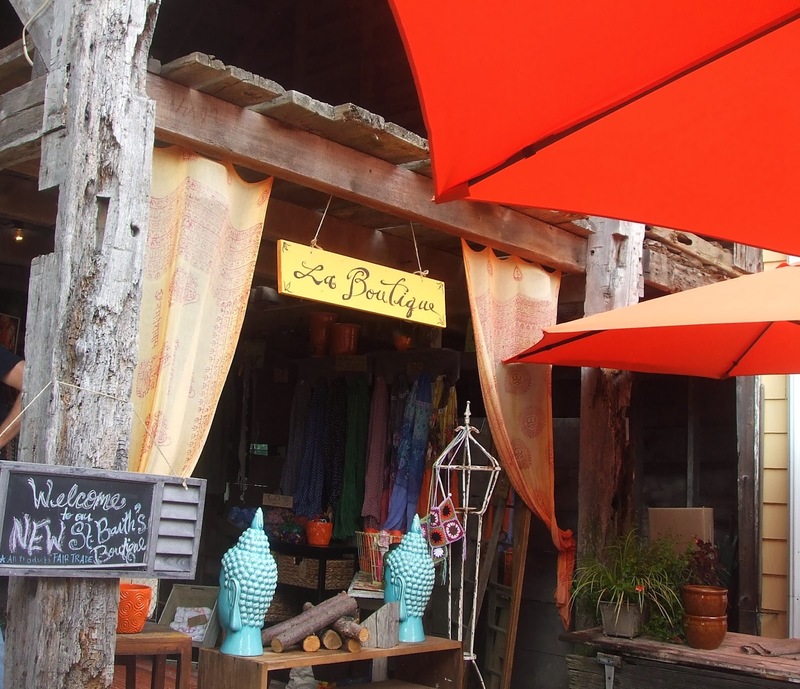 Recently, my husband and I stopped by a vineyard (below) on the North Fork of Long Island, the East Coast's wine country, and found lovely French-import scarves for sale. Needless to say, my husband and I came for the rosé, but I left with two new scarves. Since turning 50, scarf season has become nearly year-round for me. In younger years, I wrapped my neck (and sometimes my face!) in a wooly scarf on bitterly cold winter days. But I never dreamt of wearing a scarf any other time. Scarves were something my mother's generation wore on their heads to protect their coifs. These days, however, I love the pop of color and neck coverage that scarves offer. And scarves know no age limit. I never think: Am I too old to wear a scarf? Scarves can be styled in endless ways, creating a variety of looks for an outfit. 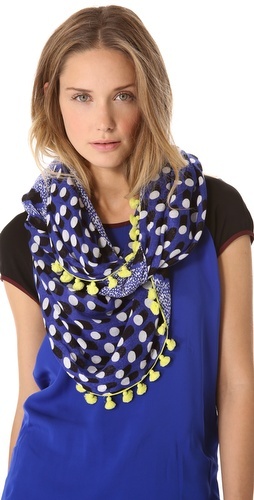 I love my new blue and white scarf (at top and above) with my black biker jacket and polka dot skirt. Remember the film, The English Patient? Early on, there's a scene in which Kristin Scott Thomas's character and a group of men are sharing stories around a campfire in the desert. To keep warm, she drapes a wide scarf over her leather jacket. I love that look! Then again, I also like to wear a scarf wrapped snugly around my neck. I also bought a narrow olive-colored scarf (below) with multiple textures at the vineyard's La Boutique. The scarf has lace and sheer panels as well as crocheted disks and fringe along the edge. It's very whimsical and makes me laugh. By the by, in case you're planning a trip to the North Fork, the vineyard's name is Croteaux Vineyards and the rosés are delicious. The place has a great tucked away, rustic atmosphere. It was a gorgeous fall day and we sat outside in the courtyard. 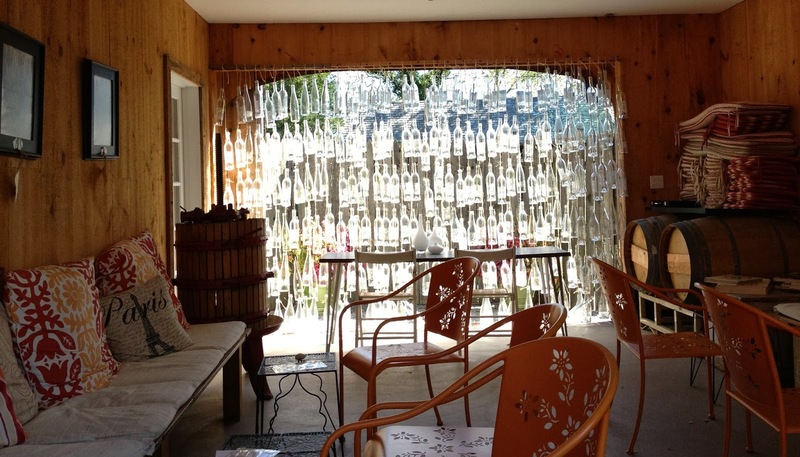 While we sipped our wine, we heard the gentle tingle of wind chimes. It turned out, they were wine chimes (below).